We’ve run out of superlatives to describe Bianca Andreescu. Spectacular, tremendous, exceptional, extraordinary, phenomenon – they all fit the mould. 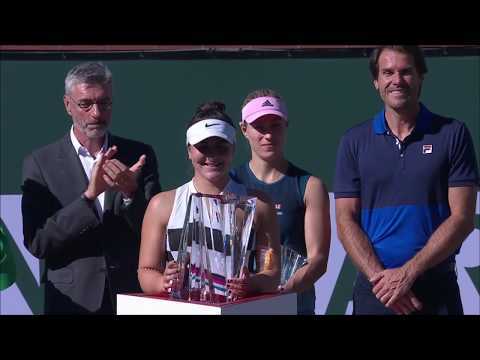 Against Elina Svitolina, ranked 54 places above her, the 18-year-old showcased every weapon in her arsenal as she fired her way to a 6-3, 2-6, 6-4 win and a place in the final of the BNP Paribas Open at Indian Wells, becoming the first wild card in history to do so. We have become so accustomed to seeing Andreescu fly out of the traps and put her opponent under pressure early in matches, particularly at this tournament. But it was Svitolina who made the better start here. Breaking the Canadian on her opening two service games, the sixth-seed looked to have taken control of the first set. However, if we’ve learned anything from Andreescu’s performances in 2019, it’s to never write her off. Showing incredible mental strength, coupled with powerful and precise hitting, the 18-year-old broke back three times in a row to turn the set on its head before going on to claim it 6-3. Game on! Game on, indeed. The second set began frantically, with three breaks of serve in the opening four games. Unfortunately, two of the three fell the way of Svitolina, who was clearly gaining confidence. The Ukrainian held her nerve, and her serve, to see out the set 6-2. At that point, all the momentum seemed to be with the 24-year-old. That quickly changed, though, as Andreescu started the third set with a break of serve, which seemed to knock the stuffing out of Svitolina. As the set continued to play out, the duo started to look fatigued from the sheer physical battle they were enduring. Andreescu in particular seemed to be running out of steam – and it showed as she dropped her serve in the third set’s sixth game. But out of nowhere, the 18-year-old seemed to find a new lease of life. A couple of shaky serves from Svitolina opened the door for Andreescu to retake her advantage and the Canadian needed no second invitation as she sealed the break with rocket of a forehand down the sideline to make it 4-3. Straight away, though, Svitolina set about trying to restore parity as she took a swift 40:0 lead in the next game. But Andreescu showed incredible endurance and maturity to rally back and hold her serve. As has been the case all tournament long, Andreescu showed no signs of wilting when the big moments came her way. She may have been unable to take her first three match points, but there were no signs of nerves on the fourth as she forced a mistake from her opponent to seal a landmark win.